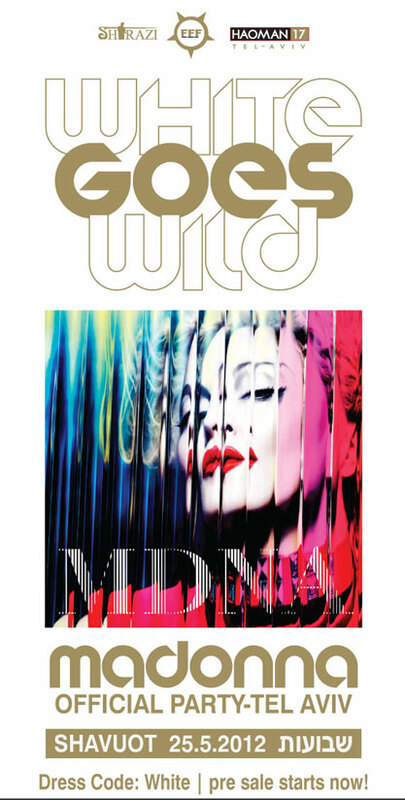 Madonna’s latest album MDNA has sold over 1.2 million copies worldwide, according to the United World Chart. It’s currently #14 on the Album Chart with 49.000 copies sold in its sixth week. Shirazi FFF & SMIRNOFF Present” White Goes Wild”, the official Madonna party in Tel Aviv on May 25th 2012. During the party will be a Special Tribute Drag Queen Show by most famous drag queens of Israel!! Russian radio station 106.9FM is currently offering tickets to the MDNA Tour in Barcelona! To participate at their contest click HERE! The official MDNA release party took place on March 23rd in Miami and was presented by Smirnoff. Madonna’s official VEVO channel has uploaded a video to give us a feel of what is was like, including interviews with Kim Fai, Tracy Young, Kid Capri, Sultan, Martin Solveig, Ned Shepard, Nicky Romero and Kerli. Madonna has sold 653,000 tickets to the 43 North American dates on her upcoming concert tour, an executive with concert promoter Live Nation Entertainment Inc. said, putting it on track to be one of the top-grossing outings on record. About 30,000 tickets remain available for the tour’s 36 U.S. shows. Most of those are either single tickets or seats that are set aside for disabled concertgoers. We are inches from sellout everywhere. Tickets for U.S. dates went on sale in mid-February and range in price from around $45 to more than $350. Some premium-priced ticket packages run $600 per person. Around 30% of ticket buyers had signed up for a free copy of the album and the acceptance rate was on the high end for such offers. Of the tickets sold in North America, Mr. Fogel said, 500,000 were in the U.S. Those free-album offers fueled a healthy first week for “MDNA,” according to Nielsen SoundScan, which reported 359,000 copies sold in the U.S.
Mr. Fogel said that between 200,000 and 250,000 of those sales represented albums given away with concert tickets. W.E. has been released in theaters in France on May 9th. The German release is planned for June 21st. The Italian release is planned for June 8th. Now back in her native Australia, Ms Jacobsen looks back on the surreal experience of a globe-trotting life with Madonna that saw entertained in Indian palaces, go to remote islands accessible only by seaplane and join the pop queen’s world tour for six months. It’s great to look back on now and reflect on. When you’re living in the bubble, it’s a lot more daunting. It was an amazing experience. [Madonna] was a great boss and I mean it was obviously quite a full-on experience. She was fantastic to work for and a big motivation for me. She’s very much a loving mother. I saw a different side to her on a personal note, how hard she works. I watched this girl power: you can do anything you want and there is no such thing as the word no. There is a way to get around that word at every opportunity.